I was blown away by the GB new compact stroller called ‘Pockit’ which is the Guinness World Records smallest stroller! It folds to a tiny package that you can put in your purse. I thought it couldn’t get any cooler than that, but this year GB came up with a new Pockit+ Plus 2018 model that doesn’t only have a compact fold, but also can turn into a travel system. Wow! The folded dimensions have slightly increased and now are 12.6″ x 7.9″ x 15″. The weight also have increased and is now 13 lbs instead of 9 lbs. Still very light and very compact model! You should have no problem taking it on board of any airline since it’s way below the maximum size for the carry-on. The Plus model can be paired with GB or Cybex infant car seat (adapters required; sold separately). They’ve also added a small strap recline to the seat, but you still have to use it from 6 months. Just like the original model Pockit+ Plus features good size basket, adjustable 5-point harness, roomy seat, and one-step brake. It rolls on small 4.5″ wheels that are design for flat surfaces only. Taking it to the park or city streets with uneven sidewalks will be a bumpy ride since there is no suspension. This model is perfect for parents who travel a lot and run errands so the stroller will be used mostly inside of the airport, mall, or store. It will be ok in the park with an even surface like a theme park for example. I think Mountain Buggy Nano, Babyzen Yoyo+ Plus, and GB Qbit+ Plus have an even more serious competition now. BTW, it is on my ‘Top 20 Best Strollers‘ list for 2018. For 2018 they’ve improved the canopy which can provide some shade now. It’s still small, but much better than before. The basket is still a decent size which is definitely a plus. This model comes in two colors and retails for around $229. -Small canopy. The Pockit+ Plus has a much better canopy than the previous model where it was barely there. Still it does not provide much sun protection. It doesn’t have a viewing window nor sunvisor. -Roomy seat. The seat is very roomy and since the canopy almost non-existent, you can fit in a very tall child. The seat is 11.5″ wide with 21″ seat back and a measurement of 25″ from the back of the seat to the top of the canopy. The seat has a small strap recline and a zipper at the top to recline the seat even more. It can accommodate a child from 6 months and up to 55 lbs. -Great basket. Comparing to full size strollers the basket is small but for such a compact stroller its not bad at all. You can probably fit your medium size diaper bag. It’s also easily accessible from the back and can hold up to 11 lbs! -Foot brake. There is a one-step brake located on the right rear wheel that will lock both of the rear wheels in place. It’s not flip-flop-friendly. -Small wheels. It rolls on 4.5″ EVA wheels with swivel front wheels that can be locked straight. These wheels are designed for flat surfaces only and not going to handle any other terrain. -The most compact fold in the world! The fold is super compact. You can almost put it in your pocket! It will definitely fit into my large diaper bag. This is a great news for traveling parents who wants to take their stroller on board on ANY airlines. Just like the Pockit, the Plus model is way below the maximum size for the carry-on. It has folded dimensions of 12.6″ x 7.9″ x 15″. Weighing only 13 lbs, it’s very easy to carry over the shoulder when not needed. There is no automatic lock, but there is a manual one. There is also standing fold which is probably not going to be used much since it’s just easier to hold it in your hands than bending down to the ground. Here is the most compact fold. It can be also folded with the car seat adapters attached. -Travel system option. You can turn Plus model into a travel system! I did not see this coming. It’s surprising that such a small stroller can accept a car seat. Plus model is compatible with GB or Cybex infant car seat (adapters required; sold separately). 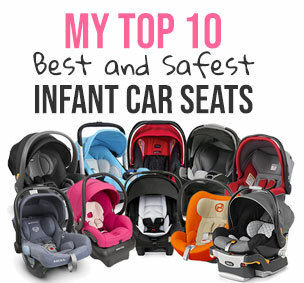 BTW, Cybex infant car seats are one of the best and safest on the market. -Small canopy. The canopy is still small. I wish there was a sunvisor. -No accessories. There are no cup holders, bumper bars nor child trays. -Small wheels. The wheels are tiny and designed only for a flat surface. Here is a quick video overview. GB Pockit+ Plus is available in two colors: blue and black. All models come with a black frame. This model comes in two colors and retails for around $229. The original GB Pockit is available now for around $179. how does the recline on the Pockit+ compare with the recline of Babylon YOYO? Where can we get the plus? I can’t find it on amazon. Needs a better/bigger sun shade, maybe a detachable one. Maybe the handles can be adjustable/clasp able like the handles of the carryon luggage for taller people. Hi there. Thank you so much for sharing your reviews. I actually have the Pockit plus and I can’t find any sun canopy or parasol to go with this stroller. I bought some and I had to return as it simply didn’t work. Have you found any that works? Hi there. I was wondering where you got the info that the stroller can hold up to 55 lbs of weight? Because I am told by the retailers now that it can only hold up to 17 kg of weight. Would so appreciate a reply as I am thinking of this stroler for my girl vut she is aleeady almost 16kg. Thanks so much. The brakes are bad, it doesn’t stay engage when activated and i couldn’t claim warranty. I’m the first owner & i only own this for 1 month. It’s a BAD choice. I am having the hardest time finding a bag to fit the stroller! Any ideas? Try a guitar strap or a one that can carry a child’s bike. You can search for them on Amazon. Clip it on the stroller so that when you fold it up it may be used as a carrying strap. Is there any significant changes in the materials used particularly in the seats? Looks “foam-y” than the previous. Does it have a mosquito net? I have this in black and red and it’s brilliant for nipping around the shops. We found a waterproof, roll top rucksack that it fits in in a hiking/outdoors shop. I would recommend taking the stroller with you to try it, as most bags didn’t open wide enough despite the fact the buggy would have physically fitted in the body of the bag. This not going to be your one and only stroller, but for most quick trips and holidays it’s brilliant. It also has a rain cover which I believe the original didn’t. I cannot find the car seat adaptors to the pocket+ for my cyber carseat anywhere on the internet. Any suggestions? Do you know how large is the decline? 145 degrees if 180 degrees is flat?